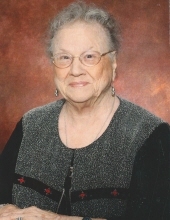 Grace M. Peterson Paige, long time resident of Ponca City, passed away on Saturday, January 26, 2019 at home. She was 93 years old. A visitation with the family will be from 9:00-11:00 A.M. with A Celebration of Life in the chapel at Trout Funeral Home and Crematory at 11:00 am Saturday, February 2, 2019 . A graveside ceremony for Grace will be held at 10:00am Monday, February 4 at the Sample Cemetery northwest of Lucien, OK.
Grace was born in Leoti, KS on July 28, 1925 to her parents Amel T. Peterson and Ella Lessenden Peterson. Grace graduated from Leoti High School in 1943. She then entered into Christ Hospital School of Nursing in Topeka KS in 1943 with the United States Cadet Nurse Corps. This was an accelerated Nursing Program with the need for registered nurses stateside and overseas due to WWII. She graduated in 1946 and started her career in Hays, KS. It was shortly after that, she met her husband Jack Paige. They were married in 1947 for 63 years until his death in 2010. Jack worked as an oil drilling roughneck. This type of work required much relocation to follow the oil drilling in the Oklahoma panhandle region. Their first child, Carolyn Sue Paige was born October 21, 1947 in Hays, KS. Daniel R. Paige was born on March 13, 1952 in Guymon, OK, soon after Michael Jack Paige was born on February 28, 1953 in Liberal, KS. The last child, Donald Bruce Paige, was born on July 7, 1955 in Ponca City, OK. They moved to Ponca City in 1953 as Jack found employment at Gruner Manufacturing as a machinist. Grace started working at the Ponca Hospital for 10 years. She then worked private duty nursing for 10 years. Her last job as director of nursing at the Ponca City Nursing Home which lasted 24 years until she retired in 1990. She was a long time member of the First Lutheran Church. She was active while living in Ponca City and became a member of St. Paul’s Lutheran Church in McAllen, TX when they started wintering in South Texas. Grace loved attending sporting events of her children starting in grade school through high school. Traveling with family and friends was her and Jack’s favorite thing to do. Many of the trips involved fishing or going to Western Kansas to visit relatives. Once they retired, Jack and Grace traveled with friends all over the country and on a number of cruises. She loved all the holidays, especially telling stories and cooking with her grandchildren. She is survived four children; Carolyn Lechtenberg of McAllen, TX, Dan Paige and wife Kathie of Rayville, Mike Paige and wife Mary of Oklahoma City, OK, and Bruce Paige of Ponca City, OK. Six grandchildren; Dena Autry of Houston , TX , Ryan Lechtenberg of Tyler, TX, Adam Paige of Excelsior Spring, MO, Kaitlynn Bailey of Excelsior Springs, MO, Alyssa Paige of Columbus, OH, Natalie Paige of Tulsa, OK. Three great grandchildren; Caleb Autry, Donovan Paige and Max Bailey. Grace was preceded in death by her parents; her loving husband Jack; and siblings Lloyd Peterson and Leta Schere. Memorial donations may be made to Hospice of North Central Oklahoma, 445 Fairview Ave., Ponca City, OK 74601. To send flowers or a remembrance gift to the family of Grace Paige, please visit our Tribute Store. "Email Address" would like to share the life celebration of Grace Paige. Click on the "link" to go to share a favorite memory or leave a condolence message for the family.